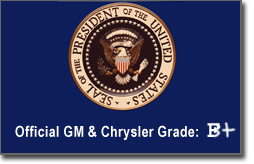 The Obama administration said today that ailing U.S. automakers GM and Chrysler earned failing grades for their turnaround efforts -- and a D+ for penmanship -- so far. The companies will be given only one more chance to demonstrate their plans to return to solvency, which both say will likely involve the alteration of the "F" on the Obama administration's report card to become a "B+". "After years of staggering losses, we now see that the letter 'F' can be changed into a 'B' with just a few lines," said Darren Patesh, a spokesperson for GM. "Ladies and gentlemen, our company is saved." He added that the company planned on adding a "+" to the B to demonstrate GM's "commitment to adding things, such as more bailout money to our balance sheets ...please?" At the White House today, President Obama agreed, saying that Detroit will qualify for additional bailout money if he is fooled by the new letter grade. "But this is, without a doubt, the last money you are getting for a long time," the President fumed, taking out his wallet. "I don't know what you spend this on, but sooner or later, you're going to have to learn some responsibility." "Now go on, get out of here," he said, breaking into a smile. "You kids know that we love you." With the new revised B+ grade and the possibility of more rescue funds to come, GM and Chrysler both say they will be "totally fine" for the next 3-5 weeks. "I'm not sure what we'll do after the money is gone, but who cares? That's so far in the future you'd need a time machine just to get there," said Darren Patesh. "All they have to do is sell a few cars," said Christina Hopewell, an industry analyst. "Cars are really expensive. If they sold even 10 cars in April, that would raise like, a lot of money." Hopewell added that the auto companies could play the lottery or invest in stocks that look risky, but will probably work out in the end. "Hey, yeah!" Ed Montgomery, President Obama's new autoworker czar, said when told of this idea. "Attention auto industry: this is your czar speaking. Please give some of your bailout money to the financial companies. They need it more than you do, you idiots. Thank you." Will all of these drastic measures really save Detroit? Only time will tell, but many citizens across the nation seemed warily optimistic. "Uh, yeah, no, I'd totally buy an American car," said one New Jersey man. "They got all those loans and stuff, so ...that's good, I guess, right?"